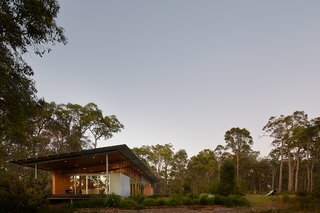 Bush House by architect Paul O’Reilly takes a page from California’s Case Study houses, and is inspired by the family’s love of the outdoors. 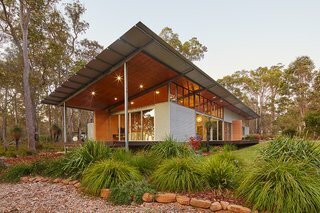 "We would to set up a canvas tarpaulin out from our four-wheel drive to camp under—to provide shelter from sun and wind and rain—and this was the main element that drove the design of the large, single roof of our dream home," says O’Reilly, founder of Western Australian studio Archterra. The tree canopy and sky peek through the clerestory windows of Bush House, whose form takes cues from California’s Case Study houses built during the ’40s through the ’60s. The mottled patina of the galvanized steel will change as it ages. 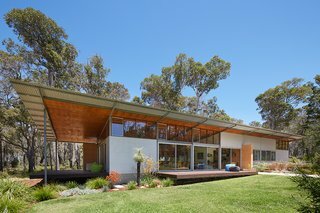 Located on O’Reilly’s family’s cattle farm in the coastal country town of Margaret River in Western Australia, the 1,808-square-foot residence sits within a clearing surrounded by jarrah bushland and eucalyptus trees. The galvanized steel frames, visible from both the interior and exterior, create a repetitive rhythm along the north and south elevations. For O’Reilly, paring the design back to a minimum was important from both an aesthetic and budget standpoint. 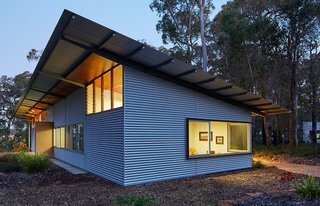 Influenced by the Case Study homes built between 1945 and 1966 in California, O’Reilly created a 12-foot structural grid that enabled a prefabricated steel frame support structure to be erected within a day. 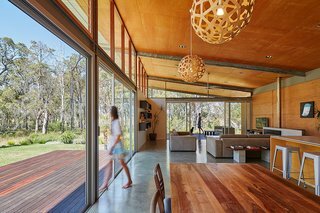 Under the shade and protection of this structure and a single-plane roof, he could then erect infill timber framing come rain or shine. 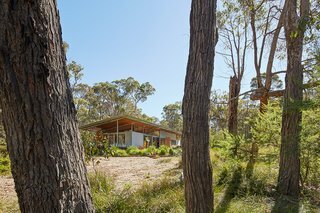 The gently sloping nature of the block generated a step in the house levels, which O’Reilly used to delineate living and sleeping zones. O'Reilly's son skateboards on a half-pipe in the backyard. "The roof plane rises up to the north to provide a view of the sky and treetops through cedar-framed clerestory windows that provide a warm and tactile contrast to the clear anodized sliding door frames," he says. 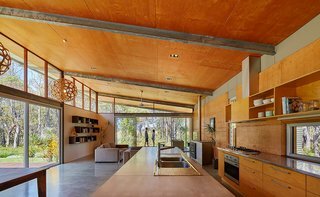 Rammed earth, concrete, galvanized steel, oiled plywood, and anodized aluminum were used for the interiors. A simple, rectilinear floor plan locates the living areas to the east, and the sleeping areas to the west. 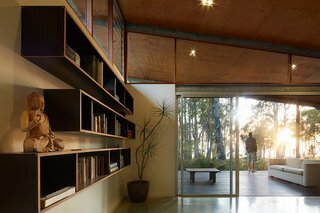 "The shared and private zones are delineated by a change in floor level, and a thick rammed-earth wall that continues through the house into the outdoors," says O’Reilly. 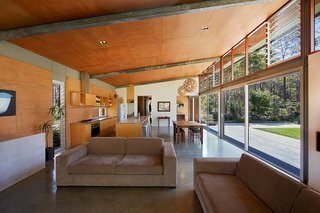 "This rammed-earth wall also defines the entry approach from the detached carport and workshop." The dining table was salvaged from a "bring out your rubbish" pile, sanded, and oiled. 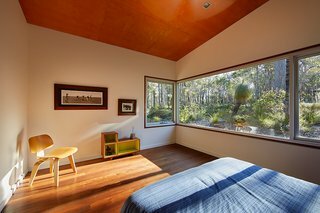 The two guest bedrooms are oriented to the north to soak up the winter sun, while the master bedroom faces the southwest to enjoy the best sunset views filtered through the surrounding tree canopy. 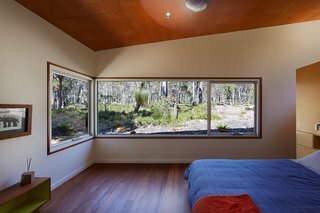 Also facing southwest is a bathroom with a glass door that opens to the bushland to create an experience of an outdoor shower. The master bedroom faces southwest, capturing the sunset. 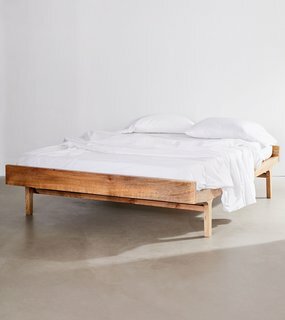 With a rustic-industrial look, this UO-exclusive mango wood bed frame features a raised construction. With solid panels that rest over a slatted base, featuring minimalist planks at headboard + footboard. 2 people recommended for assembly. From the bed, O’Reilly and his family can watch the trees sway. The house has two outdoor decks—one that sits sheltered from the elements under the overhang of the roof, and another that’s more exposed so the family can lounge in the sun or stargaze at night. The two pendant light fittings in the dining area are by New Zealand designer David Trubridge. Durability and low maintenance were key considerations for O’Reilly when it came to material selection, so he decided on raw galvanized steel, and external finishes of Zincalume metal and rammed earth, all of which needed no ongoing maintenance. The only new furniture items were a pair of couches that a were a gift from O’Reilly’s grandmother when they moved in. 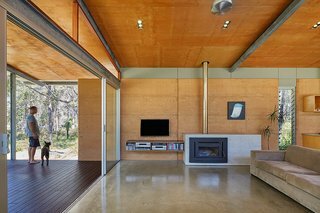 For the interiors, he chose tactile, natural materials such as rammed earth and plywood to contrast the "synthetic" concrete floors, exposed galvanized steel structure, and white painted plasterboard internal walls. "To me, good design is about the ‘less is more’ approach," says O’Reilly. 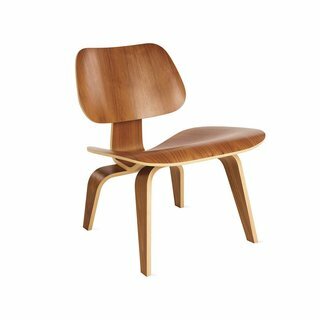 "I appreciate the Japanese notion of ‘wabi-sabi,’ or the aesthetic of the imperfect and unfinished, and sought to imbue the design with this," says O'Reilly. 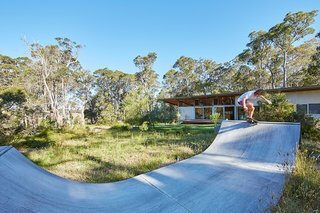 "Bush House is special to me because it’s the culmination of a long-held desire to physically build a house for my family, which I think is a really primal thing for a guy to do. Being not only the architect and builder, but also the client, gave me a lot of interesting insights into how architects go about distilling and filtering multiple ideas into a singular gesture." 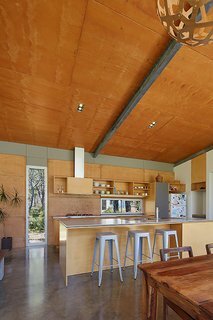 At sunrise, light bounces off the rammed earth wall, imbuing the kitchen with a warm, orange glow at breakfast.